At some point, there was going to be a correction. Pitchers have been taught forever to work off their fastballs. If not for the fastballs, after all, to what would the other pitches be compared? The fastball has always been the primary pitch, and yet it was something of an unexamined position. How many fastballs are too many fastballs? How few fastballs are too few fastballs? Do you actually need to throw fastballs the majority of the time? This is the age of information, so this is the age of experimentation. Just the other day, Trevor Bauer was critical of Avisail Garcia’s expectation of a fastball. Tom Verducci wrote up a whole feature earlier in the year about the Yankees’ fastball avoidance. One thing we know is that the fastball rate is going down. That covers only a decade, and the year-to-year changes are small, and yet the trend is unmistakable. Pitchers have always treasured their secondary pitches. Why not narrow the gap between the secondary pitches and the primary ones? 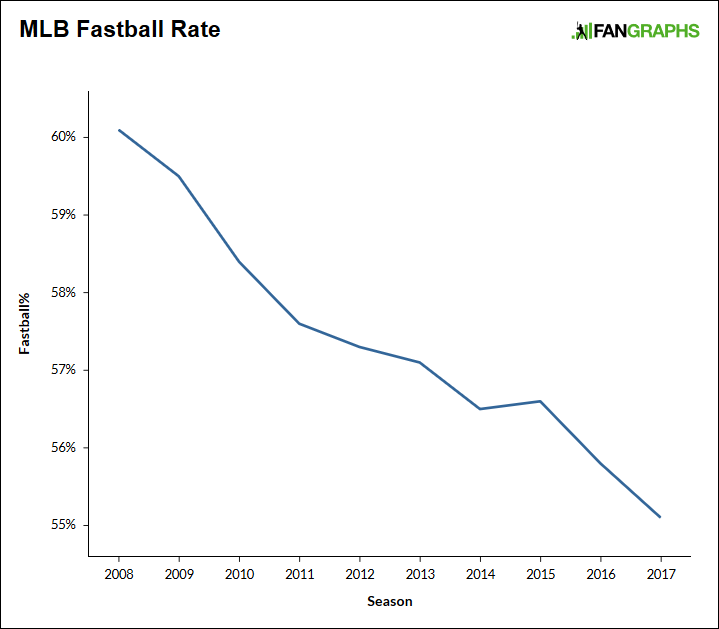 Compared to 2008, the league fastball rate now is down five percentage points, or roughly one fastball per inning. Given that everything in baseball moves slowly, this is certainly worthy of our attention. As long as we’re talking about trends, why not consider another one? The plot above shows fastball rate. The plot below shows fastball height, measured as feet off the ground at the front of the plate. Once again, the year-to-year changes are small, but you certainly see an abrupt recent shift in direction. The league-average fastball is trying to climb again. For a while, it got lower and lower, but now the average is back close to where it was in 2011. In part this is probably because the zone is about finished expanding underneath the knees, but this is suggestive of something else. So, we should break that down, using the Pitch Info information we have here on our leaderboards. Let’s ignore cutters. I think of cutters as being more like sliders, anyway. In simple terms, there are two types of fastballs: four-seam fastballs and sinking fastballs. I won’t bother trying to separate two-seamers from sinkers, if a difference even exists. I’m leaning on the excellent Pitch Info classifications. We can look at fastball rates, broken down by type. The four-seamer line has moved a little, but it’s basically stable. It’s hanging there around 37%. The sinker line, though, is dropping, sticking this year around 18%. The current difference between the two rates is just shy of 19 percentage points, which would be the largest difference of the decade. The second-largest difference came last season. While fewer fastballs are being thrown overall, it’s mostly sinkers that are feeling more endangered. If this is something that’s happening intentionally, one would suppose you could see it among the various rookie classes. 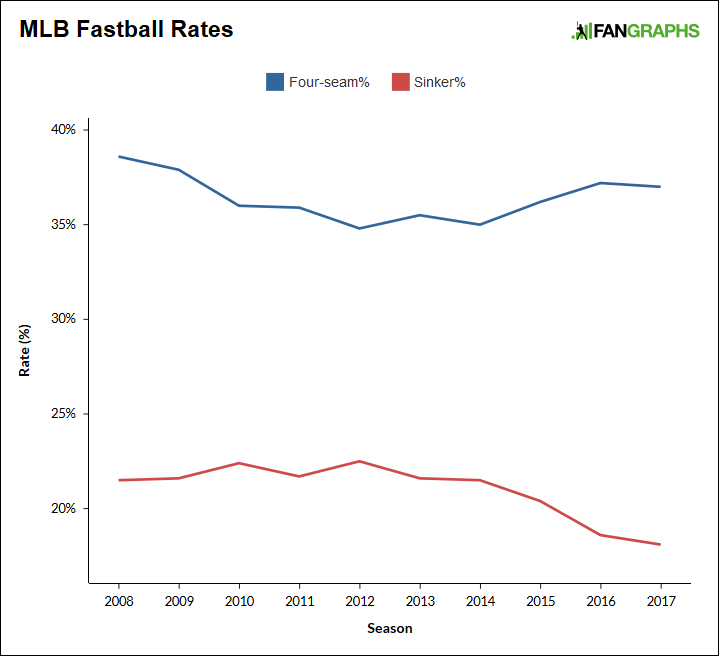 Does it seem like the majors are increasingly selecting for four-seam fastballs over sinkers? Here’s the same plot as above, only this time looking only at rule-book rookies. Note the y-axis difference between the two plots. Where the league is in 2017 is somewhere extreme. Rookies have thrown 48% four-seamers, easily a high for the decade. 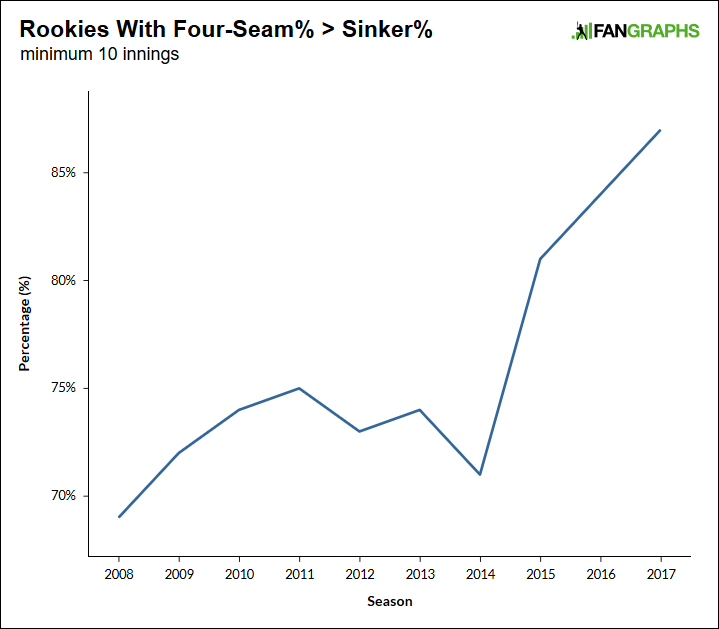 They’ve also thrown 11% sinkers, easily a low for the decade. The difference there, of course, is 37 percentage points, which is by far the greatest difference of the decade. The second-greatest difference was last year’s 31 percentage points. It’s possible this is some kind of widespread classification error, I guess, but the more likely explanation is that this captures something legitimate. Rookies seem to be strongly favoring their four-seam fastballs, and these are the rookies selected to advance to the majors. That typically only happens because the big-league team wants the rookies to help. Here’s a different way of digging into the same information. For each year, I looked at every rookie pitcher who threw at least 10 innings. Then I calculated the percentage of said rookie pitchers who threw more four-seamers than sinkers. The trend, again, has reached a new high. 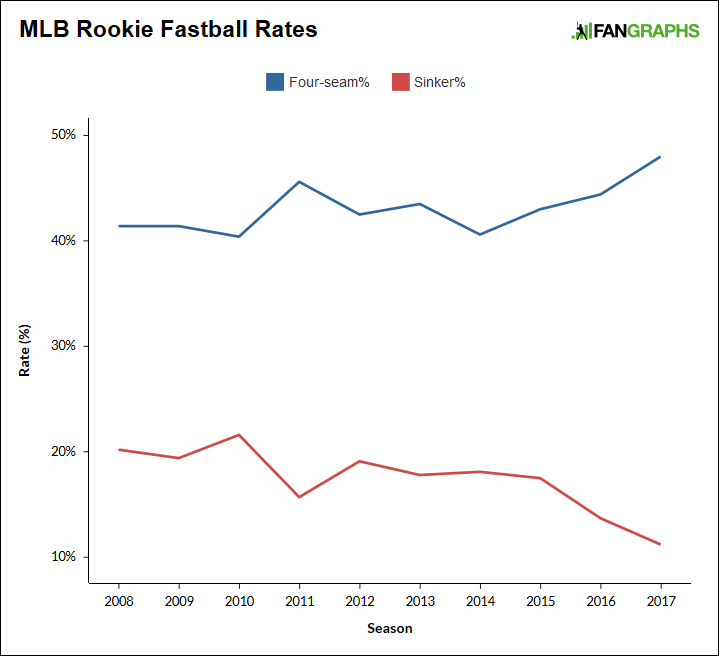 Used to be, around 70 – 75% of rookies preferred the four-seamer to the sinker. Over the past three seasons, the percentage has jumped from 81% to 84% to 87%. Four-seamers are in, and sinkers are out. It’s an easy trend to buy into, because the easiest explanation is intuitive. For some time, teams targeted sinkers for soft contact and called strikes in the expanding low zone. There was a belief that fastballs up turned into home runs. And then, of course, the league got a whole hell of a lot better at hitting the low pitch out of the ballpark. Not exclusively the low pitch, but disproportionately the low pitch. Swings started to gear up for elevating the low sinker. This is something that’s continuing today. Where many of those swings have a vulnerability is up, around the belt. The uppercut swing can have trouble connecting with pitches in the upper half, and those pitches have long gotten swings and misses, anyhow. Sinkers? Sinkers are supposed to be low. They’re not so good at the thigh. Four-seamers, though — those are pitches to get some air under. Those are swing-and-miss fastballs, and there’s nothing teams want more than to generate more swings and misses, since the penalty of contact can be so severe. Again, but quicker: My theory is that teams are increasingly selecting for four-seamers because they’re trying to combat the changing swings and approaches. Hitters grew extremely good at punishing the sinker down. It’s still possible to succeed down there — consider, say, Dallas Keuchel — but you need to pitch with ever so much precision. The four-seamer can turn into easier strikeouts, and it stands to reason that’s something teams could continue to chase until hitters get better at the high pitch again. Which should come in due time. Baseball is cyclical, and everything. The sinker isn’t dead. It’s neither dead nor dying, and with certain pitchers around the league, you might see the sinker even thrive. Yet sinkers are out there in lesser numbers, with four-seamers picking up much of the fastball slack. 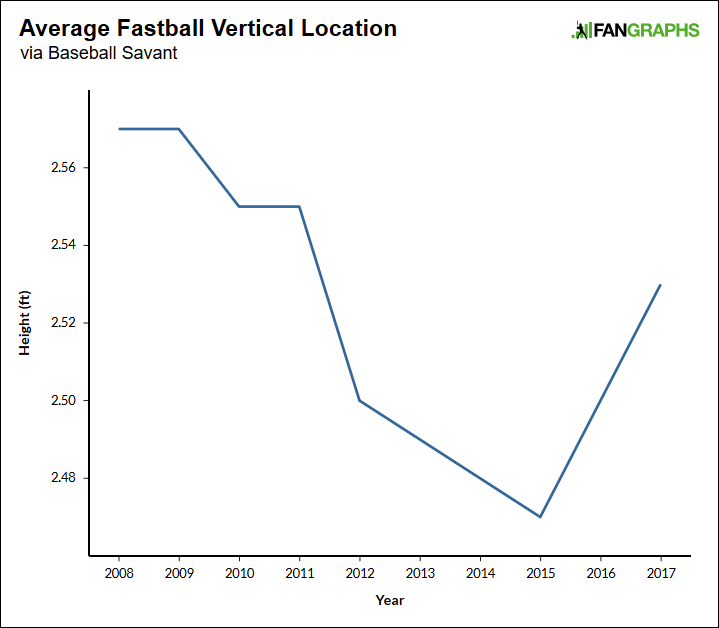 Fastballs overall are being thrown less often, but there we’re mostly talking about the dropping, tailing variety. Eventually, there could and should be a sinker resurgence. But this seems like it’s the four-seamer’s time to shine. We hoped you liked reading Baseball Is Moving Away From the Sinker by Jeff Sullivan! Is there information on the batted ball statistics, league wide, on sinkers vs. four-seamers? Or really any other pitch vs another, league wide. All of what I just spewed out doesn’t account for when the pitch is thrown in the count, so offspeed is likely to have a lower woba because it is used in pitchers counts(I think). Edit: I’m kind of a baseball savant noob so I’m not 100% sure I did the BIP part right. Thanks man, that’s exactly what I was looking for. Those stats continue to intrigue me – I think there’s a lot of questions in there. I’d guess that middle and high sinkers get hammered for a higher wOBA than comparable 4-seamers, which could contribute to the difference. The difference between well-executed sinker and poorly-executed sinker is probably much bigger than 4-seamers. Sinkers down vs 4-seam down? Sinkers have to be the winner, right? Shilling claimed that when precision was called for he threw the four seamer, the two seamer was more a feel pitch which comes and goes. Watching as I do Porcello and Fister that seems to hold very true.